Comcast Spectacor and ANC have announced that the first-ever Kinetic 4K center-hung entertainment system is in development. 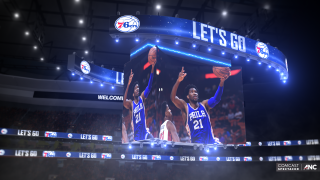 When the Philadelphia Flyers and 76ers begin play next season at the Wells Fargo Center, they will be competing under the glow of the first-ever Kinetic 4K center-hung entertainment system, which will be installed in time for the 2019-2020 season thanks to Spectacor and ANC. The new Kinetic 4K system features 65% more LED screen real estate than the Wells Fargo Center’s current center-hung model and features an unprecedented ability to transform and be configured in a variety of formats to best highlight the action below. Complementing the center-hung display are two massive crown trusses designed to create a captivating experience with multi-directional movement. Never before has an arena scoreboard had the ability to extend and compress 4mm LED technology in such an adaptive manner. When fully expanded, the Kinetic 4K system, combined with the crown trusses, will feature the most square feet of center-hung 4mm LED video technology in an arena that hosts both NBA and NHL games. While compressed, the configuration embodies a more traditional equilateral display that provides the Wells Fargo Center with an ability to tailor- fit its presentation. All together, the Wells Fargo Center’s new center-hung system features a grand total of more than 6,600 square feet of 4mm LED video technology. Comcast Spectacor and ANC worked with leading concert innovators TAIT Towers and Mitsubishi Electric Power Products’ Diamond VisionSystem Division to custom design the game-changing concept that will transform the Wells Fargo Center’s live event experience. he Kinetic 4K system has two primary configurations. The extended view deploys a mechanism that expands its vast concave sideline screens, each measuring 28’ H x 62’ W. The two end-line screens measure 28’ H x 22’ W, while the two double-sided crown trusses hang separately, with the ability to move above or below the main displays, each measuring 5’ H x 67’ W.